For many months leading into the Men’s OIympic Triathlon in Rio, the script of how the race would go wasn’t a big mystery to those around the sport. The Brownlees would exit the water with a front pack, and the biggest threats to their Olympic podium hopes would exit the water behind them, anywhere from 20 seconds or more. They would have to establish an aggressive pace on the bike early and create a gap, which the fleet-footed runners behind them couldn’t overcome. In U.S. Olympian Ben Kanute’s training and race planning, this was the scenario we predicted, and the one in which he trained for extensively. As a front pack swimmer, he knew the first 10 minutes of the bike would likely be the hardest of the race, as the gap would need be established on the first few laps of the 5K loop. This 5K loop had two steep climbs per lap, up to an elevation of 66 meters, from the start of the bike at sea level. There was also one shorter climb peppered in between the two summits. 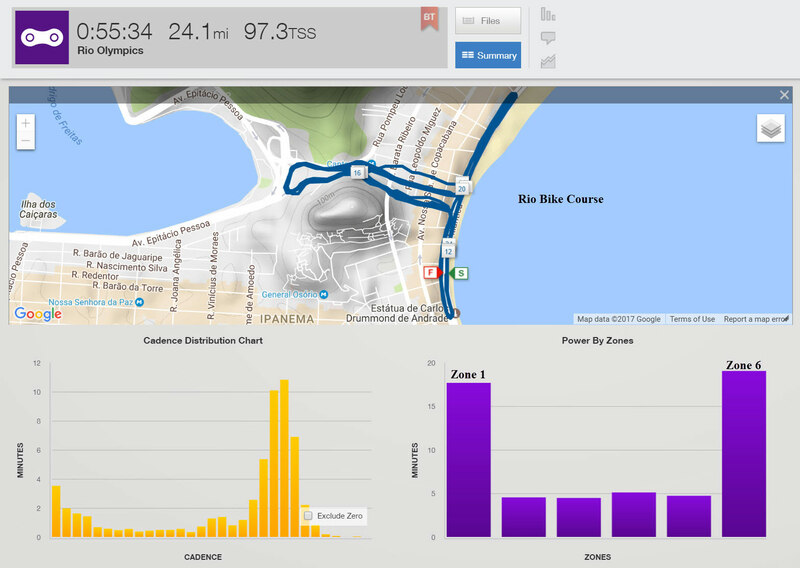 The images below show the course and elevation profile for the bike leg of the race at Copacabana Beach. 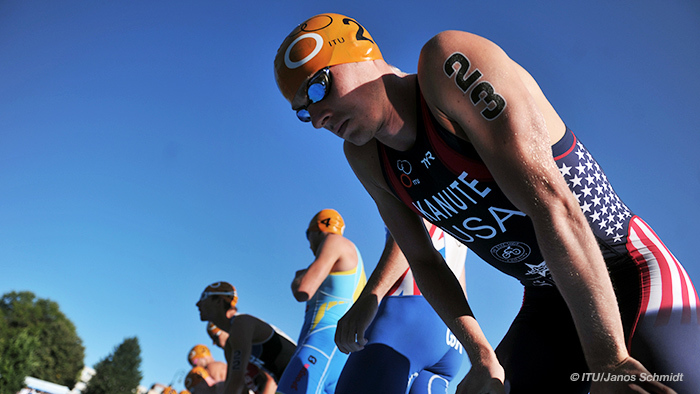 Click here to see Ben Kanute’s full power file from Rio. Kanute exited the water in 10th place, eight seconds behind the leader, Richard Varga of Slovakia, but only one second behind Alistair and Jonathan Brownlee. After exiting the water, there was a large group on the bike, but the intensity of the early pace established by the Brownlee brothers would quickly break up the group and establish a lead pack of only 10 athletes from the original field of 55. Kanute was able to establish himself in this lead pack, and the group quickly began to expand their gap with the chasing pack of top medal threats, including Mario Mola of Spain, and Richard Murray of South Africa. The gap between the lead pack and this chase group would climb from just seconds after the first lap to 74 seconds by the end of the bike. Kanute wasn’t exaggerating, the pace was very aggressive. But just how hard was this bike leg? Though some think ITU and draft-legal triathlon tends to be an easy cruise on the bike, where the athletes simply wait to run for the podium, Kanute’s Rio data tells a very different story. 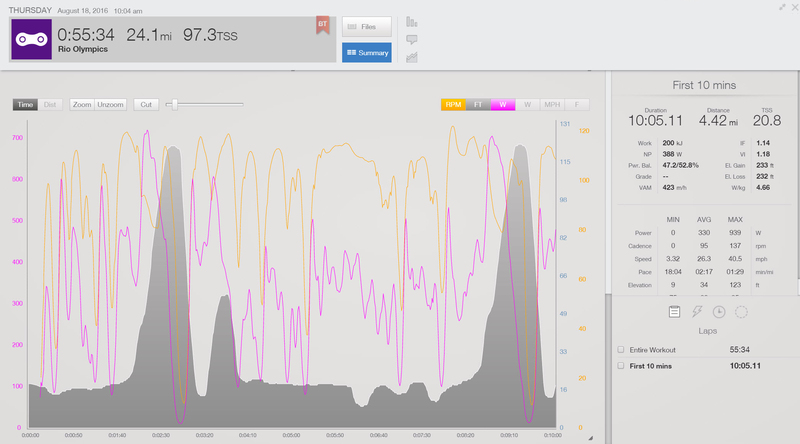 In Figure 1, you can see the overall demands of the race required Kanute to spend most of time either coasting and soft-pedaling in Zone 1, or sprinting and surging in Zone 6. 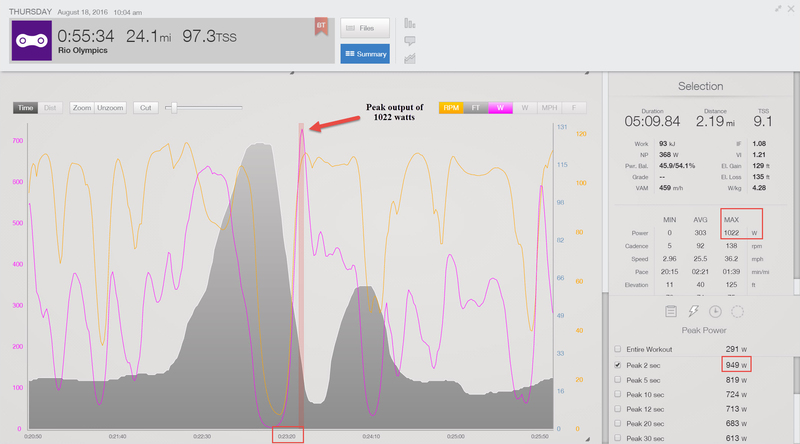 Interestingly, despite how hard the early laps were, Kanute’s peak power output for the race happened in minute 23 of the race, at more than 1000 watts, as shown in Figure 3 below. This surge didn’t happen on an uphill, but rather at the bottom of the first major climb of that lap, just before the second. Kanute defines this race as the hardest bike effort he has ever done in an ITU race, and video highlights of the race below, starting with the swim exit, help illustrate how the large group out of the water quickly dwindled down to the small lead pack of 10 due to the intensity of the bike. Not every race Kanute does will be like this, as courses and competition change, as well as projecting the race tactics and demands will always play a role in any race you do and the training decisions you make in order to prepare for them. But one thing is for sure, the Olympic Triathlon is one hard race! How Much Should You Run During IRONMAN Training?